Actually, we can name this operation as “partial column transfer”: we have to transform a part of column data into a values of new column(s). There are several ways to make a flat table from this report: by Excel formulas, by VBA macro, or by Power Query in Excel 2010-2013 (“Get & Transform” in Excel 2016) or by Power BI. Although transforming of this table in VBA could be very fast and scalable solution, our club cashier is in horror of any macro as he is convinced that it can steal his soul important information about club’ finances. So we will avoid a VBA solution for a while. An Excel formulas solution also looks very easy, but it has to be implemented “by hands” each time we got a report, and our cashier is too lazy to do it every month. Ok, let’s start with Power Query. The sample workbook for this case could be downloaded from here. In this case I will use named range for detecting our data area, but for practical purposes it looks more convenient to make a query to a source from another Excel file (we then have no need to define named range or make a table from a range). So let us define the named range on whole report area and call it “Charges”. Just select report from cell A1 to last filled cell in column B and enter “Charges” in name field left to the formula bar. First of all, let’s prepare data for following transformations. We need to clean all unnecessary data from report and make it more… usable. Open an “Empty query” in Power Query window. Click on “Table” left to our “Charges” name to expand. Remove header rows: Main / Reduce rows / Remove rows / Remove first rows: 2. Whether or not, this data has the structure, and it’ll help us to “unravel the mystery” (and even in several ways!). Give the query a name of “ChargesClean” and save it (“Save&Load to…” and make connection only). This query will be a source for our follow-up. What if we will solve this task in Excel “by hands”? The answer is a short formula for C4: = IF(A3=”Date”,A2,IF(A4=”Member name:”,””,C3)) . Then we just need to fill column C down with this formula, and result will be exactly what we are looking for: for each table we’ll got a corresponding person name right to column of charges and empty cells between tables. We can even shorten it: = IF(A3=”Date”,A2,C3) and get cells between tables filled with names form above table. Then we just need to replace formulas with values, remove rows between tables and inner headers. We can do this in Power Query too. Just remember methods of relative references we made clear in my previous post: we need an “Index” column. Right click on “ChargesClean query” – Make a link to it. Select “Custom” column and Transform / Fill / Down. Now we can remove “Index” column. 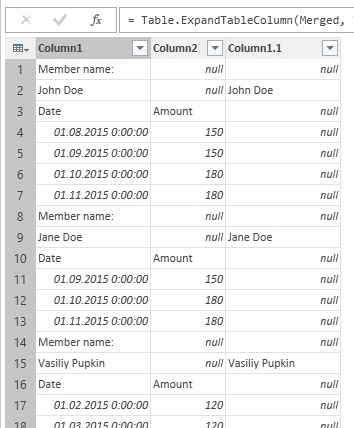 Remove rows that we do not need any more by apply a filter to “Column2”: uncheck “null” and “Amount” values. 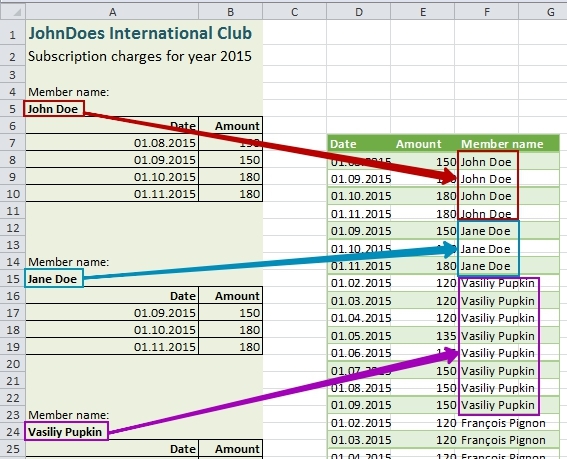 Rename columns: “Column1” to “Date”, “Column2” to “Amount”, “Custom” to “Member name”. 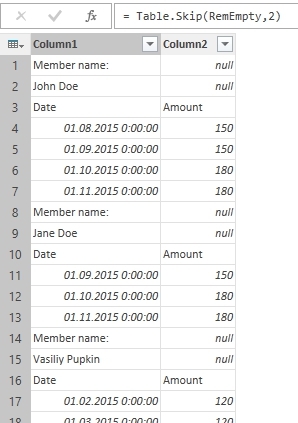 Change data types for columns: “Date” to type date, “Amount” to currency, “Member name” to text. Name our query as “ChargesR1C1” and save result to a sheet. You can see that “partial transfer” works the same way in Power Query as it works in Excel: we just adopt Excel formula to ‘M’ language of Power Query. But it is necessary to remember that using relative references in Power Query can clause a big performance decrease if a source is too large, so it is better to find another, more POWERful solution. 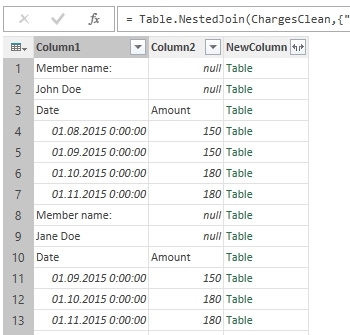 The other way to add columns to a table in Power Query is a merge of two tables. Really, if we would have two tables, one is our source and other with values we would like to add, and if we could find a key to link these tables, we can construct a new table with desired structure and data. In the source (“ChargesClean” query) we have the only values which could play a role of a link key: it is the names of club members. Really, other data in the source is not distinct and cannot be used as identifier of data tables: only member name differs tables from each other. So, if we’ll got an appropriate table, we could link it to the source by this field. Suppose that all names in the source are distinct, like MemberID, and let’s make a table to merge then. 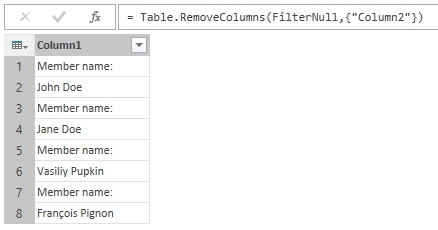 Select “Column2” – filter – uncheck all except “null”. Here we can filter this column to exclude the pointer “Member name:” or use trickier approach: remove alternating rows. To do this just use Main – Remove rows – Delete alternating rows, then enter 1 as row number to start, 1 as number of rows to delete and 1 as number of rows to skip. Anyway, the result is the same, but I recommend just filter out “Member name:”. We can see that all member names from first column are doubled in the new column. The familiar table which need a standard make-up. Select “Column1.1” – Fill – Down. Change data types of result to date, currency and text accordingly. We’ve got the same result as in Excel-style transformation, but without resource-consuming calculations for each row. Now we can “Save&Load” it to a new sheet. Here I’ll explain the trick used in step 4, as promised. When we make a merge from inside a query editor, we add other query to current. But for our goals we need current query to be added to our cleaned source with left outer join. Usual way to do this is either go to ChargesClean and perform merging in it, or make a new query by combining two other from “Workbook Queries” panel. But “ChargesClean” is used as a source in other query, so if we perform merging in it will cause an error in “ChargesR1C1”. And I don’t want to make any queries, so I just simulate this: I replaced first query name with the name of cleaned source. And as far as we used “ChargesClean” as a source to “ChargesMerged”, we can refer to the “ChargesClean” or to the “Source” step from “ChargesMerged”. There also other way to link this source with a list of distinct names, but it is too much for a single post. Credits: this post, being inspired by question on TechNet PowerQuery forum, was written under strong influence of excellent blog by Chris Webb, “’M’ is for (Data) Monkey” book by Ken Puls and Miguel Escobar and theirs blogs, the Gil Raviv blog on TechNet and a lot of other Power Query and Power BI pros & enthusiast. I followed your two methods and produced a similar looking Excel table. If I create a Pivot Table off both worksheet tables then I get the correct result. However, if I source from the data model in the more complex case then I get the amount total against each date. This is due to the data model having two tables with no join. Is there a way to correct the data model? This will cut out the step of needing to use a worksheet for the normalised data. You wrote about two tables, but the result of my code is a single table. I cannot catch what is your case – what are the two tables you are talking about? What if I need more complicated formula (i.e. 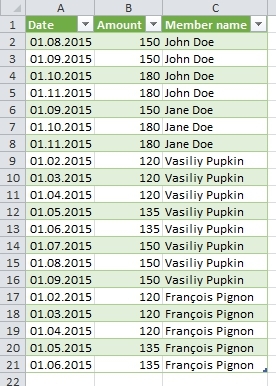 Vlookup) ? How do I insert it in an added column? Could you please add details to your question?